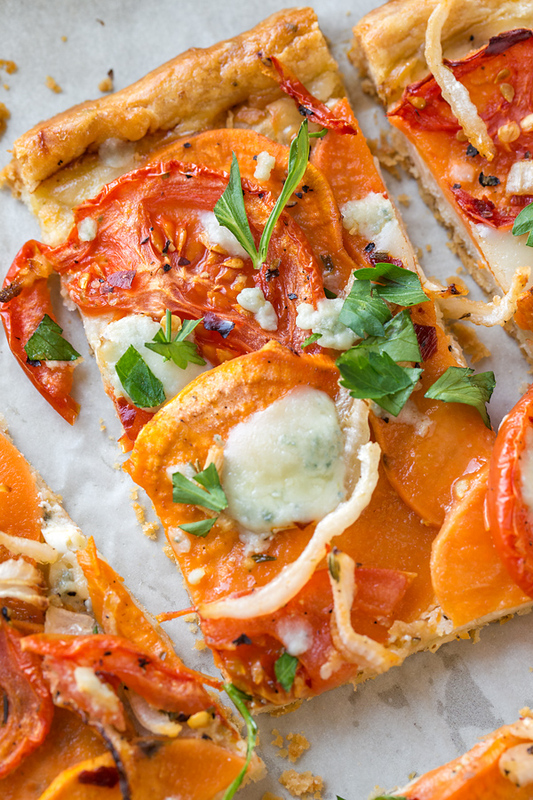 This savory tomato tart with a simple buttery crust, sweet potatoes and onions, and a sprinkle of tangy-salty gorgonzola cheese is that special rustic treat that’s perfect for the fall—colorful, fragrant and wonderfully cozy. I cannot express how exciting it is for me to finally be bringing out my recipe ideas for the fall season. I love everything about the fall—the beautifully rich and earthy colors, the fragrant scents of either spice or of something warm and buttery, the golden light that is utterly perfect for contemplation and daydreaming, the milder outdoor temperatures (ideal for experimentation in the kitchen), and the seasonal recipes that involve the oven and offer some coziness. My way of unwinding often times is to get into my kitchen and bake, to try out something new that perhaps I’ve wanted to try out for a while, or to jump in and have a go at something that just popped into my mind that simply can’t wait. It’s a wonderful challenge, baking, but the results are often so very worth it, especially when success is found; and let me tell you, I did indeed find success in the form of a light, flaky and delectable savory tomato tart—a delightfully colorful companion to the autumn season. Tarts Can Be Savory Too! I had seen some lovely savory tarts gracing the covers of food magazines recently, and already had a rough concept for a tart of my own in mind that I wanted to try, though I wasn’t quite set on the exact ingredients and combination for flavors. I knew I wanted to use tomatoes and onions (a delectable duo, indeed), but what else? I had a couple of sweet potatoes already on hand, and a little gorgonzola, and those seemed like perfect companions for the other ingredients in the tart. Not only would all of these ingredients be great flavor pairings, they also provided that amazing color that gloriously represented the look, feel and flavor of fall. The crust for this tart is all-butter, the same recipe that I use for my sweet pies, yet without the pinch of sugar—I added a few savory ingredients instead. And again, let me tell you, when the aroma of that crust, along with the onions, the gorgonzola and the sweet potatoes and tomatoes began wafting out of the oven as the tart baked… speechless! 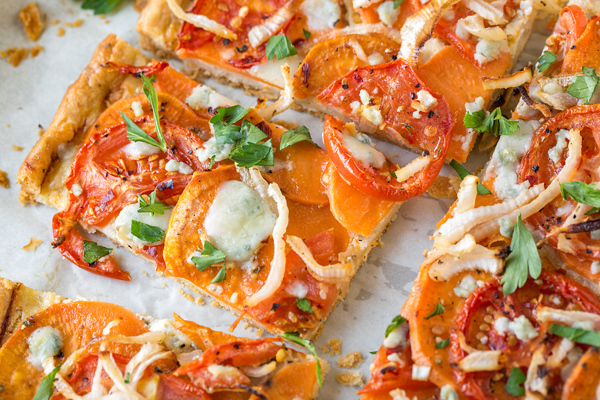 The flavors of this tart are truly spectacular—there’s a subtle sweetness from the sweet potatoes and even the tomatoes, the onions, and the gorgonzola offer a nice tangy-salty bite..
As tarts go, this tart recipe in particular is not difficult to prepare; it’s delicious for lunch, brunch, or dinner (or even breakfast) pairing wonderfully with a spicy green salad, served either on the side, or piled up on top of the tart. What a fall stunner this tomato tart ended up being! Enough dough for two tarts: The dough recipe yields enough for two tarts. You can freeze the other disc until you’d like to make another tart, then simply defrost in the fridge and use. The more rustic, the better: Part of the beauty of a recipe like this is that it is rustic and free-form. Roll out your dough until quite thin, and allow it to have its own unique shape. Crimp the edges just a little to create a “lip”; then, add your ingredients, and brush the edges with a little egg wash, and bake until golden. Slice the veggies thin: To ensure the veggies become nice and tender, slice them very thin. If you feel comfortable using a mandolin, use that for the sweet potatoes as you’ll want slices just a little thicker than potato chips. 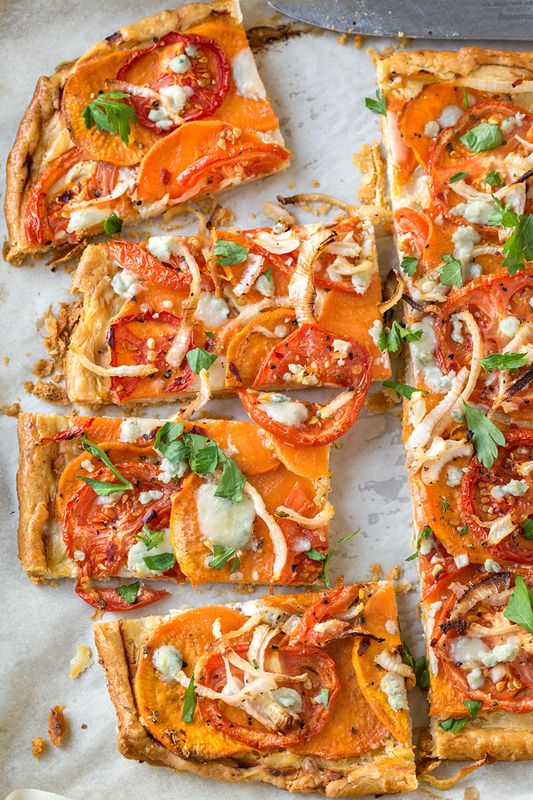 Serve warm or cold: This savory tomato tart is wonderful when allowed to cool slightly out of the oven until just warm, or even room temp; it’s also delicious served cold, as you might serve a quiche. How to reheat: Place a slice into the toaster oven and bake at 350° for 3-4 minutes, just until warmed through; it’ll come out nice and fresh and fragrant! 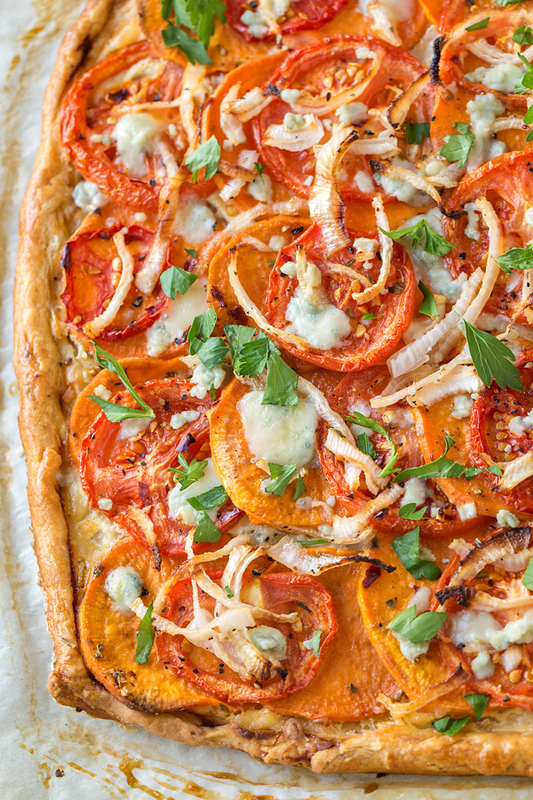 Buttery and flaky, this savory tomato tart is filled with wonderfully colorful and flavorful ingredients like sweet potatoes, onions and gorgonzola, making it a beautiful and light “main dish” option for fall. -Prepare your dough by adding the flour, salt and Italian seasoning into the bowl of your food processor and pulse to combine; add in the cold butter and pulse until the butter resembles peas; then, while pulsing, drizzle in the ice-cold water until the dough comes together (it will be a little sticky); then turn it out, divide in half and flatten into discs, and wrap each disc in plastic wrap; chill one in the fridge for 1 hour, and freeze the other for another time. -Once your disc of dough has chilled and rested, preheat the oven to 375°, and line a baking sheet with parchment paper. 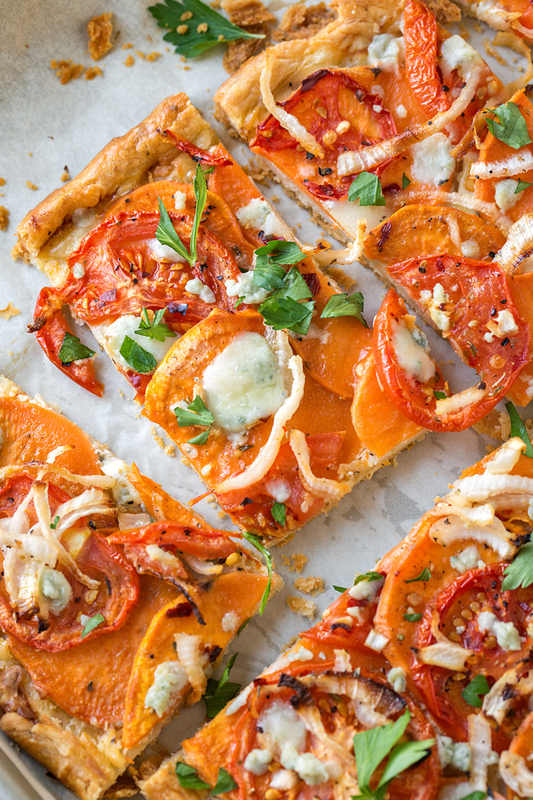 -Drizzle a little olive oil, about 1 tablespoon worth, over the sliced tomato, sweet potato and onion, and sprinkle over a bit of salt and pepper, plus a pinch of red pepper flakes; set aside while you roll out your tart dough. -Roll your dough out on a floured work surface into a rectangular shape about 1/8” thickness (about 14” x 12”), and place the dough onto the parchment-lined baking sheet; crimp the edges with your fingers, making a little “lip”, then spread the sour cream over the bottom of the dough, and sprinkle over half of the gorgonzola cheese. -Layer with the thinly sliced sweet potato and tomato, alternating the two until all are used, and top with the sliced onion. -Whisk the egg with a touch of water to make the egg wash, and brush a little over the crimped edge of the tart; then, bake the tart for about 55 minutes, or until golden-brown. -While still warm, sprinkle with the remainder of the gorgonzola cheese, as well as the chopped parsley, and allow to cool on the baking sheet until warm, or even room temp (even cold); then slice and enjoy! We’re thinking you might like this Savory Quiche with Herb Crust recipe too!